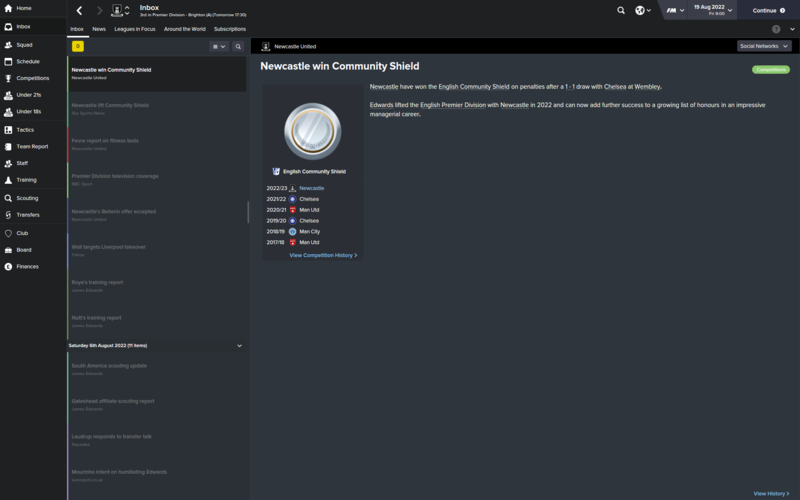 My attempt to make the name of Newcastle United feared across Europe once again! Went out on penalties after a 3-3 aggregate draw with Aston Villa in the semi finals. We hit the post an inordinate number of times in the 2nd leg, but it just wasn't to be. Won away at Brighton 3-1 and then beat Liverpool 3-0 at home but lost 2-0 in the quarter final against Southampton. Beat Sporting 5-1 on aggregate in the 1st knockout round. However, Valencia knocked me out after a 3-3 draw on aggregate, where they went through on away goals. Hate that rule. We are top of the league, with 63 points in 28 games! It's a 2 horse race between us and Chelsea, who are 2 points behind us. Finished 1st with 83 points. We scored a whopping 102 goals in our title winning season. Was such a close run thing, Chelsea always pouncing on us whenever we dropped points. But we've finally done it. Proud as punch. Honourable mentions to Barkley, Wilson, Donnarumma, Perez, Moreira, Gray and Dier who were all key to our title success. I won the 20/21 manager of the year award. Lost 3-1 to Chelsea in the Community Shield. Currently 1 point off the top. Have 35 points after 15 games. Went out of the Capital One Cup after a 3-2 loss to Derby. Great stuff for winning the league mate - next stop Champions League! Who needs Rafa Benitez?!!! Didn't do any business in the January transfer window. 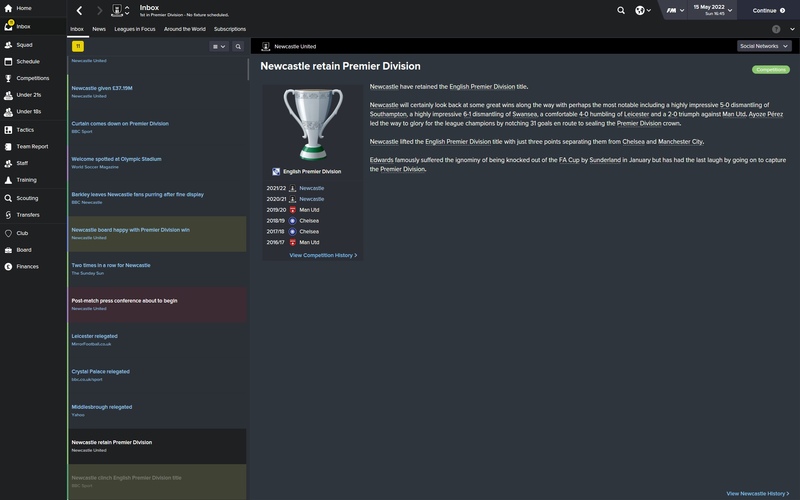 We retained the Premier League title, finishing 1st with 92 points! Perez was league top scorer with 31 goals, and Sane was top assister with 21 assists. Finished 3rd in my CL group after a 3-2 loss against Monaco. Then got knocked out of Europa League after a 3-2 aggregate loss against Sevilla. I got a new 5 year contract, as well as the manager of the year award. England won the 2022 World Cup, with Butland, Dier, Chambers, Gray, Wilshere, Barkley and Wilson all featuring. Loaned Matteo Fedele and Simon Thompson out for this season. Dier remains as captain and Perez as vice captain. As a note of interest, I now have 5 regens in my squad (Verdier, Garcia, Hall, Louis and Kruse). Won the Community Shield against Chelsea after a 17-16 win on penalties. Champions League group has Benfica, Monaco and Basel. Currently sat in 3rd place with 30 points from 14 games. Lost 2-1 away at Tottenham in the C1C 3rd round. Finished 1st in the group, unbeaten with 16 points from the 6 matches. Going to play Derby in the FA Cup quarter finals, and Shakhtar in the Champions League knockout round. Finally beat Man City in the Premier League. Only took 8 seasons! Beat Shakhtar 6-1 on aggregate in the knockout round. Then beat Porto 3-2 on aggregate in the quarter finals. So tomorrow, I will play out the remaining 4 Premier League fixtures, face Real Madrid in the Champions League semi finals, and go head to head with West Ham in the FA Cup final! Finished 3rd with 82 points. Got knocked out of the Champions League semi finals after a 4-1 aggregate loss to Real Madrid. Sane won Premier League Footballer of the Year, and also finished top assister with 21 league goals. WE WON THE FA CUP! Beat West Ham 3-1 in the final! In the words of Tim Sherwood, second to none. You are reading "The Sleeping Giant Rises".